The research uncovered in this report will be instrumental in understanding the burden that caregivers face when managing Alzheimer's disease. 82% of current caregivers report keeping loved ones in their home or the patient's home. Of those women, 39% feel they have no other choice; only 16% of care is provided in a nursing facility. 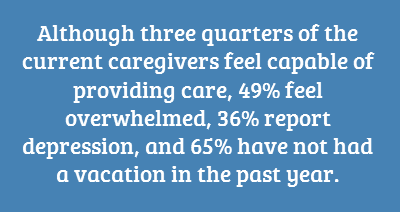 Although three quarters of the current caregivers feel capable of providing care, 49% feel overwhelmed, 36% report depression, and 65% have not had a vacation in the past year. The number of caregivers who live with their patients has doubled to 40% of current caregivers from 15% of former. Both nursing home and assistant living use has declined. A whopping 84% say they themselves would want to be diagnosed early, and 51% wish their loved ones had been diagnosed sooner. Only a third of patients were diagnosed at the disease's early stage. How would you compare these findings to your experience? Please use the comments box below this article. A major new report on the dramatic toll Alzheimer's disease is taking on women in the U.S., who are shown to be the primary caregivers for loved ones, reveals an increasing cost to their personal and professional lives as well as their pocketbooks. The study entitled Women and Alzheimer's Disease: The Caregiver's Crisis, surveyed 1,204 current and former caregivers who provide unpaid care for loved ones suffering from Alzheimer's disease and was commissioned by the Working Mother Research Institute and featured in the June/July issue of Working Mother magazine and online. The Working Mother Research Institute report is sponsored by GE, with knowledge support from the Alzheimer's Association. Women now make up two thirds (66%) of the estimated 5.4 million Americans with Alzheimer's and provide the majority of unpaid care for loved ones suffering from the disease. The full Caregiver's Crisis report can be found here. "The findings are dramatic. Caretakers are providing hundreds of hours of assistance every month while juggling careers, marriages and kids. The bottom line is that too many women find themselves caught in a role they did not anticipate, sustained only at great personal cost and with no clear end date. The caregiver's entire life is affected, and the responsibility weighs heavily on her family and job, not to mention her own health." The burden is colossal: Working Mother calculates, based on data from the Alzheimer's Association and The Shriver Report: A Woman's Nation Takes on Alzheimer's, released in 2010, that 6.7 million women caregivers devote some 10 billion hours per year—working out to about $126 billion in unpaid labor. "The research uncovered in this report will be instrumental in understanding the burden that caregivers face when managing Alzheimer's disease," said Pascale Witz, president and CEO, GE Healthcare, Medical Diagnostics. "We are proud to sponsor this study, as it sheds a new light on the impact of Alzheimer's disease on women caregivers and increases women's knowledge of the disease." The study finds that caregiving and careers don't mix well. Thirty-nine percent of current caregivers surveyed say they passed up promotions because of caregiving. Slightly fewer, 36%, say it has impacted their ability to get ahead. More than half of the current caregivers say they needed to adjust their work schedules to accommodate caregiving, and 39% say they passed up promotions because they couldn't manage additional responsibilities. Nearly half of the respondents say they're having difficulty managing the demands of work and home, and one third don't think they're doing their best on the job. A total of 41% of caregivers are getting regular help from a nurse or aide, and more than 61% did get regular help of some sort in providing care. The study found that 58% are providing care for parents, 12% for spouses and 12% for in-laws. Current caregivers are spending an average of 47 hours a week providing care, and 58% don't know how long they will be needed. Caregivers report feeling a sense of isolation due to the demands of taking care of the Alzheimer's patient: One third said they weren't satisfied with their social life; one in four hasn't been out to dinner or a movie in the past six months. "An estimated 2 million women are bearing the brunt of caring for their children and a loved one with this degenerative disease. And as with all elder care, responding to Alzheimer's is a marathon, not a sprint," says Jennifer Owens, director of the Working Mother Research Institute. "Indeed, life expectancy after diagnosis averages eight years, but can be much longer. One third of caregivers surveyed said they've been assisting a loved one for more than four years." "This study reinforces the fact that women take on the responsibility of caregiving. Alzheimer's impacts many areas of their lives including career, relationships, children and their own health," said Angela Geiger, chief strategy officer of the Alzheimer's Association. "It is important for women to know that they can turn to the Alzheimer's Association for guidance and resources for themselves and for the circle of people they support." Almost 80% of respondents indicate their doctor has not discussed aging with them, and 87% have not discussed Alzheimer's. Multicultural women report slightly better results (77% have not had their doctor discuss aging; 81% report no discussion of Alzheimer's). There is a slight difference between age groups: 82% of respondents 54 and under have not had the aging discussion, vs. 76% for 55 and over. Not surprisingly, current caregivers have better results, with 68% indicating their doctor had not discussed aging and 66% saying their doctor had not discussed Alzheimer's. Close to 40% of the patients of current caregivers have long-term care insurance (former caregivers report an even higher rate of 51%). Mean out-of-pocket expenses for current caregivers are $2,585 annually. This is a 25% increase from former caregivers. African American women report the highest out-of-pocket at $3,198. Ten percent of minority women surveyed estimate their expenses at $10,000 or more, vs. 5% of Caucasian caregivers. The online survey was developed by the Working Mother Research Institute and conducted by Walker Communications, January 6–11, 2012. A total of 1,204 surveys were completed, 531 current and 673 former caregivers. The profile of the survey participants is: 59% are married/partnered, 84% have kids (29% under 18), and 86% attended college. The mean income of the respondents is $42,800. A total of 79% of the respondents are Caucasian and 21% are minority women. Working Mother magazine reaches 2.2 million readers and is the only national magazine for career-committed mothers. GE (NYSE: GE) works on things that matter. The best people and the best technologies taking on the toughest challenges. Finding solutions in energy, health and home, transportation and finance. Building, powering, moving and curing the world. Are Alzheimer's Caregivers the Forgotten?